Gold Filled caps with gold filled clips. Line pattern of nine lines, space, nine lines, repeating all around the caps, and plain cap bands. Gold filled content at bottom of caps. Gold Filled caps with gold filled clips. Line pattern of group of five lines tapering up to one point near the clip, repeating all around the caps, and plain cap bands. Gold filled content at bottom of caps. These caps have deep engraved lines unlike the later aerometric series tapered line caps. Gold Filled caps with 14k solid yellow gold clips in “window pane” pattern. Model was sold as “Heritage” by Parker. Line pattern of horizontal and vertical lines throughout the caps, and plain cap bands. Gold filled content at bottom of caps. Smooth 14k Solid Yellow Gold caps with 14k Yellow Gold clips. No pattern on caps. Marked 14K on caps and clips. 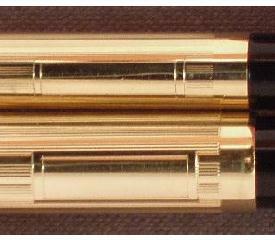 All 14K capped “51s” were marketed by Parker as the “Heirloom”. Interestingly enough, this newly discovered cap on the right, out of Germany, shows what would appear an imprint on the cap for export. The cap is marked “585” instead of the usual U.S. imprint of 14k, probably due to European laws concerning gold content. Pink and Green Gold Solid 14k caps with icicle or “Empire” pattern with 14k Green Gold clips. One of the most recognizable and desirable “51” caps. Pattern was copied for the Limited Edition 2001 Parker “51”. 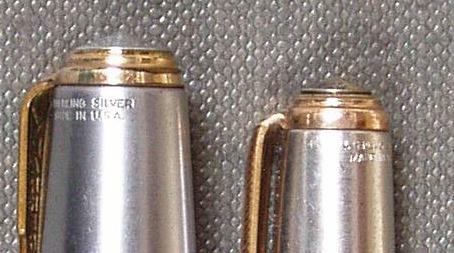 All 14K capped “51s” were marketed by Parker as the “Heirloom”. 14k Solid Yellow Gold caps with 14k Yellow Gold clips in “fishscale” pattern. Marked 14K on caps and clips. 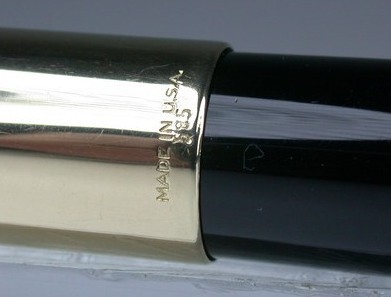 All 14K capped “51s” were marketed by Parker as the “Heirloom”. Pink and green solid 14k gold caps with Coronet pattern with green gold 14k clips and trim. Pattern is of chevrons in pink gold over yellow gold, with rectangle for engraving. This pattern carried over from the famous Parker Vacumatic Coronet series. Very few pens and pencils have been found. Gold Filled Caps with gold filled clips. Pattern is groups of 4 lines and a space, all around the cap, with no cap band. Gold content at bottom of cap. Has rectangle for engraving, framed by double lines. Found with aluminum jewels most of the time. The design carried forward in later years, but with the rectangle space for engraving eliminated. This is the most common gold filled first year cap. Gold Filled Caps with gold filled clips. Pattern is groups of 2 lines and 2 scalloped lines, all around the cap, with no cap band. Gold content at top of cap. Found with aluminum jewels most of the time. Sterling Silver Caps with lined pattern and gold filled clips. Although this design essentially carried over into the later production pens, the chevron cap bands for First Year pens have a unique, simpler design. Several versions of these caps exist. The most common has the “Sterling Silver” imprint below the chevron band. A second version is nowhere imprinted as to metal content. A third version has the “Sterling Silver” imprint up by the clips in a rectangle box. Found with aluminum jewels. These caps were also advertised by early Parker catalogs as the “Heritage” with 14k solid gold trim. Smooth Sterling Silver caps with gold filled clips and chevron band. All Sterling Silver caps were originally rhodium plated to prevent tarnish. Plating wore off quickly or was polished off, most often resulting in a shiny finish. Silver content at top of cap only. Found with aluminum jewels most of the time.